Everybody knows for a circle. But for a circular lake on the Earth, the ratios are not constant. In the case of a lake, let be the length of the shoreline, its area, and the distance along the surface from the center to the shore. Let the radius of the sphere be . The radius of the Earth is 3963.192 miles. A circular lake with lake radius miles has . Perhaps whoever was thinking of defining to be 3 had this lake in mind. For a circular lake on a sphere with radius and lake radius , , and . The ratios and are candidates for " " for a circular lake. All four of their limits are as or (as the lake flattens and becomes more like a disk). 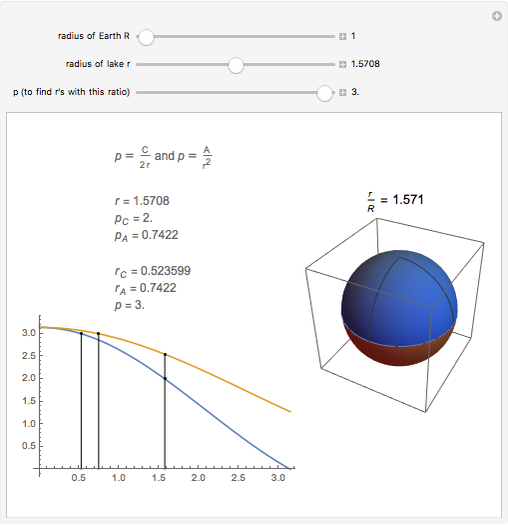 The slider ranges from 1 to 3963.192, from the radius of a unit sphere to the radius of the Earth in miles. Set and move to be between 0 and . The circular lake ranges from a point to all of the sphere except a point. When , the circular lake is the upper hemisphere and When , both ratios are a little less than 3. Move , the imitator, to determine values of and for which and , for from 1.4 to 3. Then set r equal to or to see what these lakes look like. Roger B. Kirchner "Pi-Like Ratios for Circular Lakes"